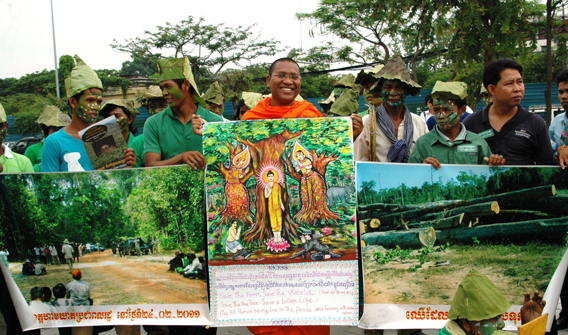 Cambodian villagers dressed as ‘avatars’ to protest the destruction of their forest. Photo courtesy of: Prey Lang Network. 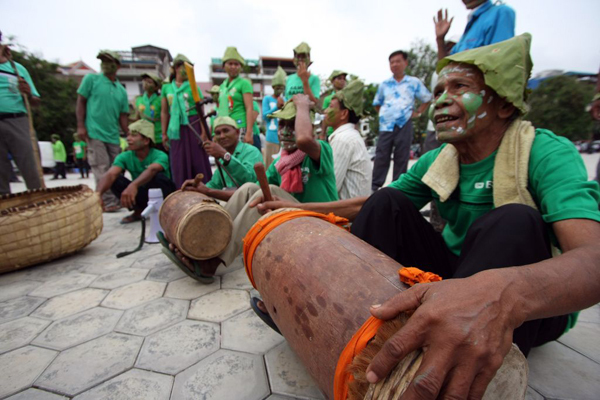 Two hundred Cambodians rallied in Phnom Penh last week to protest the widespread destruction of one of Southeast Asia’s last intact lowland rainforests, known as Prey Lang. 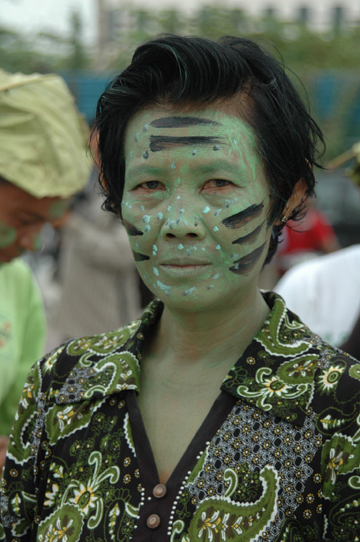 In an effort to gain wider media attention, protestors donned dress and make-up inspired by the James Cameron film, Avatar, which depicts the destruction of a forest and its inhabitants on an alien world. The idea worked as the rally received international attention from Reuters, CNN (i-report), MSNBC, and NPR, among other media outlets. Located between the Mekong and Stung Sen River, nearly half of Prey Lang has never been logged, making it an incredible rarity in Southeast Asia, whose forests, according to Conservation International (CI), are the world’s most imperiled. Tigers, Asian elephants, banteng, gaur, and Asiatic black bears are all still found in the 200,000 hectares of forest. In all up to 50 endangered mammals, birds, and reptiles may live in the forest. 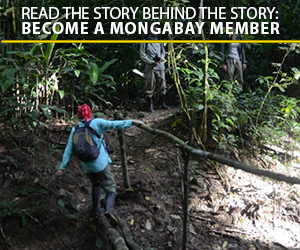 In addition to its wildlife, the largely unprotected forest is also home to a quarter of million people who are largely dependent on its renewable resources, many of whom are from the Kuy indigenous group. Protestor in costume. Photo courtesy of: Prey Lang Network. Still the biodiversity and ecosystem services, including vital watersheds, provided by the forest have not stopped officials from handing out large tracts of the rainforest for clearcutting. Recently, the Cambodian government has granted a concession of over 6,000 hectares to a rubber company. Clearing for biofuels also threatens the forest. The villagers also delivered a petition opposing land concessions in Prey Lang signed by 30,000 people to Cambodia’s National Assembly. The petition calls on the Cambodian government to rescind any current permits and establish Prey Lang as a protected area. 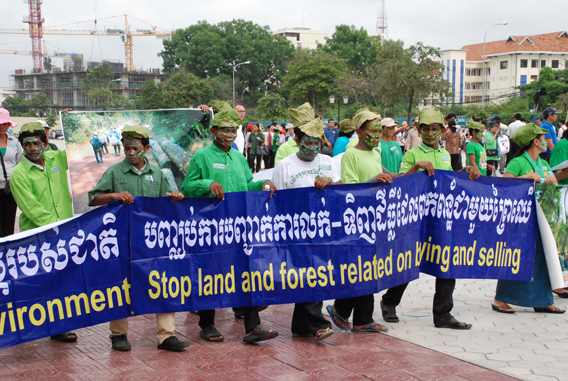 “Nature cannot speak out, and we are dependent on natural resources, so we have to speak out on its behalf,” Som Lach, a protestor, told the Phnom Peng Post. Protestors were joined by wanted activist and monk, Loun Savath, who left the protest early in order to avoid arrest by authorities. Savath, who painted faces at the rally, is known for his work on social justice and land issues, efforts that have made him wanted by government officials and condemned by religious leaders. Protestor playing traditional music. Photo courtesy of: Prey Lang Network. Nearly a third Cambodia’s remaining primary forest, considered the most biodiverse and carbon dense of forests, is thought to be in Prey Lang. According to the Food and Agriculture Organization (FAO) around 330,000 hectares of primary forest survived in Cambodia in 2005. The government hasn’t released recent figures. However, the last two decades has seen many of Cambodia’s forests decimated: 22 percent of the nation’s forest has been lost since 1990. Ubiquitous illegal logging, rapid development, and a booming population have all contributed to the decline in Cambodia’s forests. Recently Cambodia’s Prime Minister, Hun Sen, addressed the issue of forest clearance for rubber while speaking to university students. However, the Prime Minister not long after signed over 9,000 hectares of Vereak Chey National Park for conversion to rubber plantations despite it being a protected area. A public forum on the fate of Prey Lang forest is being conducted today with local communities. Villagers plan to attend the forum dressed as avatars. Rally in Phnom Penh included activist monk Loun Savath, pictured here in the center. Photo courtesy of: Prey Lang Network. Rally protesters included the very young. Photo courtesy of: Prey Lang Network. Marching for Prey Lang forest. Photo courtesy of: Prey Lang Network. 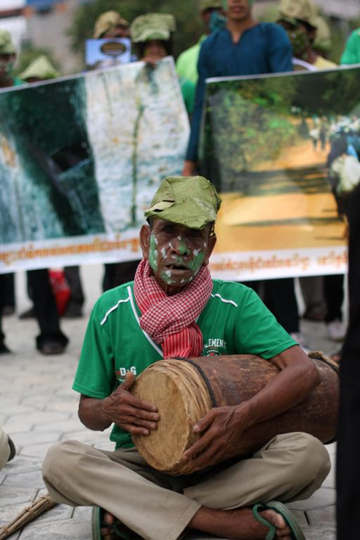 (03/10/2011) Cambodian villagers fighting to save their forest from rubber companies have been rebuked by the local government. Two days in a row local authorities prevented some 400 Cambodian villagers from protesting at the offices of the Vietnam-based CRCK Company, which the villagers contend are destroying their livelihoods by bulldozing large swaths of primary forests. Authorities said they feared the villagers would have grown violent while protesting. (05/11/2011) Suwanna Gauntlett has dedicated her life to protecting rainforests and wildlife in some of the world’s most hostile and rugged environments and has set the trend of a new generation of direct action conservationists. She has designed, implemented, and supported bold, front-line conservation programs to save endangered wildlife populations from the brink of extinction, including saving the Amur Tiger (also known as the Siberian Tiger) from extinction in the 1990s in the Russian Far East, when only about 80 individuals remained and reversing the drastic decline of Olive Ridley sea turtles along the coast of Orissa, India in the 1990s, when annual nestings had declined from 600,000 to a mere 8,130. 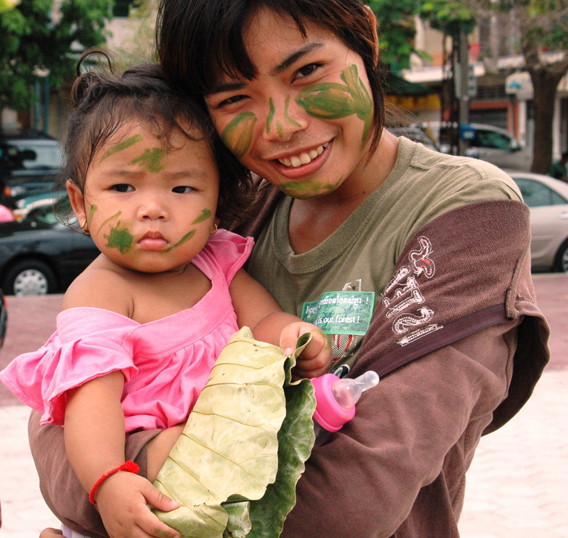 When she first arrived in Cambodia in the late 1990s, its forests were silent. ‘You couldn’t hear any birds, you couldn’t hear any wildlife and you could hardly see any signs of wildlife because of the destruction,’ Gauntlett said. Wildlife was being sold everywhere, in restaurants, on the street, and even her local beauty parlor had a bear. (04/11/2011) In a surprise move, the Cambodian Prime Minister, Sandech Hun Sen, has cancelled a titanium strip mine project in one of Southeast Asia’s last great intact forest ecosystems, the Cardamom Mountains. According to a press release sent out by the Cambodian government the mine was canceled due to “concerns of the impact on the environment, biodiversity and local livelihoods” of villagers. The mine, which was planned to sit directly in the migration route for the largest population of Asian elephants in Cambodia, had been largely opposed by locals in the region who spent years developing eco-tourism in the region.